The RadRibbonTab can be styled by creating an appropriate Style and setting it to the Style property of the control. To copy the default style, load your project in Expression Blend and open the User Control that holds the RadRibbonView. 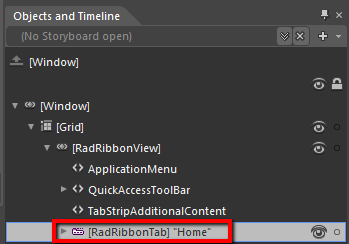 In the 'Objects and Timeline' pane select the RadRibbonTab you want to style. 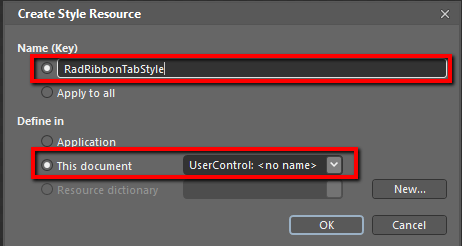 After clicking 'OK', Expression Blend will generate the default style of the RadRibbonTab control in the Resources section of your User Control. The properties available for the style will be loaded in the 'Properties' pane and you will be able to modify their default values. You can modify these properties to achieve the desired appearance. However most of the visual parts of the RadRibbonTab have to be styled in its template. To modify it select the style in the 'Objects and Timeline' pane, right-click on it and choose Edit Template -> Edit Current. 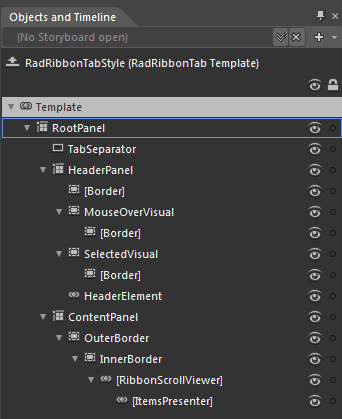 In the same pane the element parts for the RadRibbonTab's template will get loaded. RootPanel - a Grid control that represents the main layout control in the RadRibbonTab's template. TabSeparator - a Rectangle control that represents the separators used to divide the tab headers. If you want to modify the default style of the RibbonScrollViewer control, you can follow the approach described in this article.